Sooner or later, the Revolution will put their current struggles behind them. Such is the nature of MLS, a league in which even the mightiest fall upon hard times. But the end won’t come until the team undergoes some serious self-reflection if coach Jay Heaps is to be believed. 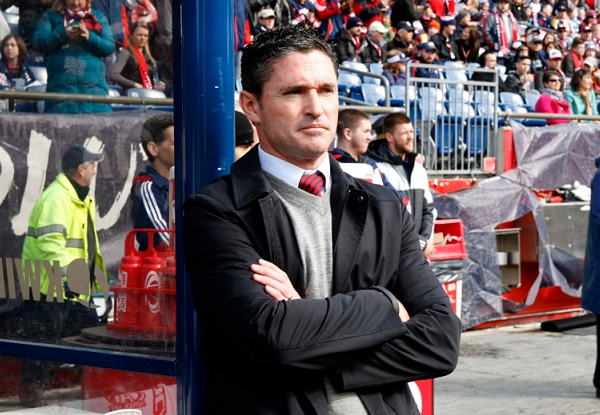 Following Wednesday’s 2-1 loss to the Crew, a game in which the Revolution wasted another early lead, Heaps touched upon the idea that his players, as a collective unit, might be their own worst enemy. That was certainly apparent in Sunday’s loss at DC, where Heaps mentioned that his players appeared to be overly anxious on their passing, as if the collective belief in holding the ball was non-existent. But there were moments in Wednesday’s affair in which their confidence wasn’t there. After Lee Nguyen buried the opening goal inside of 35 seconds, the Revolution were quickly put on their collective back heel by the Crew, which used precise passes and well-timed runs to climb right back. In the fourth minute, Federico Higuain smacked the crossbar, and the ball fell right toward Kei Kamara, who was unimpeded on his follow-up header for goal. On many occasions, the locals tried to work their passes through the midfield, only to pull the trigger too soon and watch a Crew defender step in and intercept it. One such victim was the normally-reliable Daigo Kobayashi, who connected on only 62.5 percent of his passes at halftime. Right after the break, the Revolution were out-possessed by the Crew 95.2 percent to 4.8 percent – yes, you read those stats correctly – during the 45th and 50h minutes, and paid dearly for it. In the 50th minute, Kei Kamara slotted through his second goal of the game on a Ethan Finlay ball inside the box for the game-winner. Heaps was quick to point out that the issue isn’t just a matter of defense. The Revolution coach spoke about missed opportunities on the attacking end, especially during the second half, when his club started to put together sound spells of possession. Heaps won’t have much time to find those pieces with his club’s third game in seven days on tap for Saturday against Vancouver. While the Revolution will be able to return to their familiar home grounds for the inter-conference clash, Heaps noted that his entire team – from top to bottom – will need to improve in order to reverse their current fortunes. “It’s a collective weakness right now that we’re not putting teams way when we have a goal advantage,” Heaps said.